Rose Community Foundations names Innovate for Good 2016 Awardees! Rose Community Foundation has long supported innovation. In our grantmaking, it comes with our vision for the future, helping address systemic problems by offering long-term solutions. We believe philanthropy can be a tool to create positive community change as well, so we strive to find opportunities where resources can make a difference. Rose Community Foundation’s Innovate for Good was born from such innovation, created to find and fund new, innovative projects to make the Greater Denver community a better place to live in 2015. This year, the project took on a theme and awardees were chosen for their fresh perspective and insight in answering the question, What idea could you bring to life to empower youth to make the community better? The awarded projects differ in many ways, from population and neighborhoods served, to focus, approach and audience. And yet all of the winning projects promote human connection and in-person interaction, making a powerful, unexpected statement about how young people from a “digital generation” view giving back to the community. A total of $250,000 in grants and support was awarded to six Youth-Adult Partnership projects and four Youth-led projects. The six Youth-Adult Partnership awardees received a grant of $30,000. The four Youth awardees will each receive $5,000. 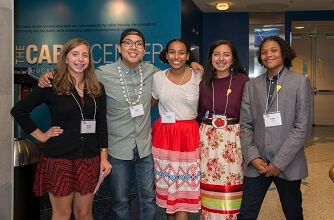 In addition, all awardees and finalists will receive year-long training, coaching and skill-building from the San Francisco-based and nationally-recognized Youth Leadership Institute.